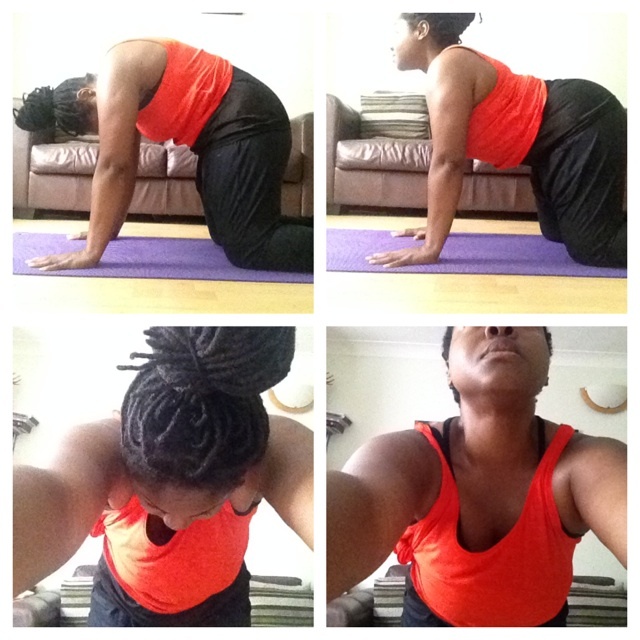 #getyouromback 31 Day Yoga Challenge from Sweaty Betty. Sweaty Betty’s 31 Day Instagram Challenge involves practising one pose each day (a different post for each day of July). I think this is a great way to start building a home yoga practice! My philosophy behind U Can Yoga from day one has been and remains that you can find your own expression of yoga, that yoga is for anyone who wants to give it a try and experience its many benefits. I am taking part and will be posting some pose variations and instructions on Instagram with the intention of sharing a few ideas to make these poses a bit more accessible along the way – e.g. some standing and seated versions for those of us who find getting onto the floor a challenge. Find out how to get involved by visiting the Get Your Om Back page at Sweaty Betty’s website here. And find me on Instagram @ucanyoga1. Embody’s yoga foundation courses are an excellent way to learn the basic principles of yoga and gain an appreciation of its many benefits. Running on Sunday afternoons for 6 consecutive weeks, this beginners course is a great way to introduce yourself to the practice of Yoga. Over the duration of the course I will be guiding you through the fundamental yoga postures with an emphasis on correct alignment and proper breathing techniques. For full details and to book, please click here to visit the Embody Wellness website. 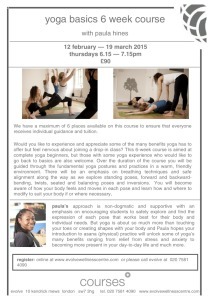 have time to sign up for the next Laxmi Yoga 200hr Teacher Training with Sally Parkes. Taking place over weekends in London plus a residential week in Spain this recognised Yoga Alliance UK and Independent Yoga Network course allows you to teach internationally. The first of the London weekends is 28th February-1st March. I’m looking forward to meeting all the new teacher trainees in April when I’ll be introducing the group to teaching Restorative Yoga and Yoga for Back Care. For full details, plus to hear from past graduates click here to visit Sally’s website. To register please click here or call evolve on 020 7581 4090. Is one of your goals to begin a yoga practice in 2015? 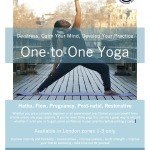 Whether you’re a complete beginner or an experienced practitioner you can benefit from private one-to-one yoga sessions. If you’ve never done yoga before this can be a great way to explore whether it is for you or to gain some confidence in your practice before joining a class. One-to-one yoga lessons can take place at Embody Wellness in SW8 or evolve in SW7, with easy access to Central London, or another convenient venue at times to fit your schedule. For more details and to get in touch about 1-2-1 Yoga please click here. 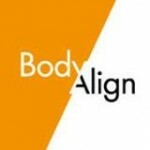 From Tuesday 11th November – you can now join me at the earlier time of 6-7pm at BodyAlign. Offering Pilates, yoga and functional classes, BodyAlign is a small-sized studio offering more personal, specialised sessions with no more than 10 people per class. Based at The Artworks, an exciting creative enterprise community on the corner of Elephant and Walworth Road close to Central London, it’s certainly worth a visit, as recommended by health and fitness blogger Carly in her pick of the best for November (click here to read). Visit the BodyAlign website here for further details and see all the classes on offer on the timetable here. To celebrate 1 month of opening its doors, join us for Body Align’s Open Day this month. 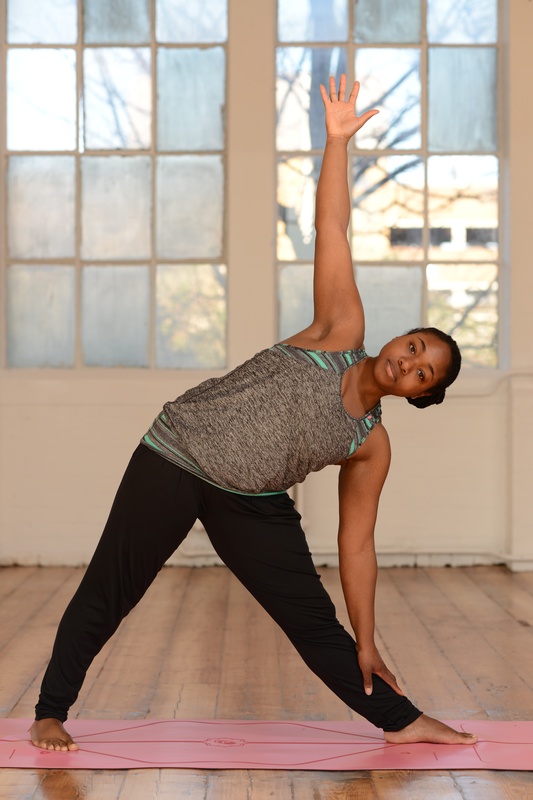 Have you had a chance to visit brand new wellbeing studio, Body Align in Elephant & Castle yet? If not, then the October Open Day is the perfect chance for you to sample a range of yoga and Pilates sessions and more all under Body Align’s cool yet quirky roof. Based at the new Artworks development, the studio is housed in refurbished shipping containers. All levels welcome! Class times will be displayed once they are all confirmed on the Open Day Event Page on Facebook here. If you can’t wait, then you can sign up now for the introductory offer of £30 for 14 consecutive days and try as many classes as you like – from Forrest, Ashtanga, Broga and much more to a wide range of Pilates classes for all levels, there’s plenty to choose from. Plus, you can still join me on Wednesdays for Hatha & Gentle Flow at the NEW time of 7.45-8.45pm. Keep an eye on the Body Align Facebook page for full Open Day details as they are confirmed. And to see all of the classes currently on offer visit the timetable here.